A shooting drill useful also as a pre-practice warm up. Players have to jog up and down the floor, shoot, rebound and pass the ball. 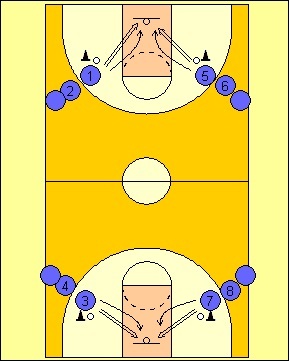 Set up two shooting spots on one side of the floor at both end of the court. Two or three players and a basketball at each spot. If you have several players set two more spots on the other side, as shown in the diagram. The first player in each line shoots and quickly rebounds his own shot. He/she passes the ball back to the next player on the same shooting spot. He/she jogs to the spot at the opposite half court, waits for the pass and shoots again. 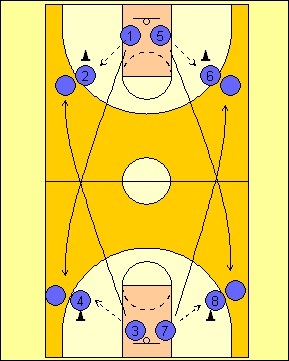 All players repeat this routine jogging up and down the floor, shooting from the two spots (same side), rebounding, and passing the ball to next players. The drill continues for five minutes or more. Repeat as needed. - Make sure all players are using good shooting form. - Go quick for the rebound and make a sharp pass. - The shooter shows his hands presenting a target for the pass. - Make it competitive. The player who scores a given number of shots wins. - Change shooting spots. Set three-pointer spots. - Players execute a shot fake followed by a dribble for a jumper.